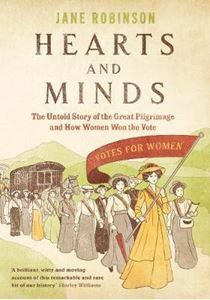 Set against the colourful background of the entire campaign for women to win the vote, Hearts and Minds tells the remarkable and inspiring story of the suffragists' march on London. 1913: the last long summer before the war. The country is gripped by suffragette fever. These impassioned crusaders have their admirers; some agree with their aims if not their forceful methods, while others are aghast at the thought of giving any female a vote. Meanwhile, hundreds of women are stepping out on to the streets of Britain. They are the suffragists: non-militant campaigners for the vote, on an astonishing six-week protest march they call the Great Pilgrimage. Rich and poor, young and old, they defy convention, risking jobs, family relationships and even their lives to persuade the country to listen to them. This is a story of ordinary people effecting extraordinary change. By turns dangerous, exhausting and exhilarating, the Great Pilgrimage transformed the personal and political lives of women in Britain for ever. Jane Robinson has drawn from diaries, letters and unpublished accounts to tell the inside story of the march, against the colourful background of the entire suffrage campaign. Fresh and original, full of vivid detail and moments of high drama, Hearts and Minds is both funny and incredibly moving, important and wonderfully entertaining.